"This is simply gorgeous because it's so comforting! 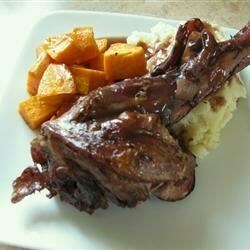 The lamb shanks are slow cooked in a generous amount of red wine. Preparation is easy, too, it goes from stovetop to oven. This is best served with the pan juices poured over a creamy mashed potatoes, sweet potatoes, pumpkin, risotto, or even soft polenta." Heat the olive oil in a heavy, metal roasting pan on the stove over medium-high heat. Toss shanks with flour to coat well; then shake off excess. Sear the shanks in hot oil until well browned on all sides, then remove from pan and set aside. Add the leek, celery, carrot, onion, and garlic to the roasting pan. Cook until softened and lightly browned, stirring constantly; about 5 minutes. Season with the bay leaf, peppercorns, thyme and rosemary sprigs. Pour in the red wine and chicken stock, increase heat to high, and bring to a simmer. Season to taste with sea salt, and place the lamb shanks on top of the vegetables. Cover the roasting pan tightly with heavy aluminum foil, and place into the preheated oven. Bake gently until the meat is tender and falls off of the bone, 2 1/2 to 3 hours. Remove the bay leaf and herb stems before serving shanks with vegetables and sauce. This was delicious! I was in a hurry so I didn't even sear the shanks. Just threw it in a crock pot and let it cook for 6 hours. Next time I'll add some new potatoes. I have made this several times now and it has become a family favourite. Great with mashed potato. Thanks for the recipe!